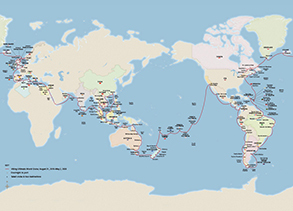 Join Viking Sun as she circumnavigates the globe and collect more travel milestones during one cruise than most people do in a lifetime. Sail roundtrip London, cruising to six continents and visiting 113 of the world’s greatest cities and charming smaller ports. Immerse yourself in local cultures with overnight stays in 23 different destinations. Join us for an enriching odyssey on a voyage of discovery as we embark on this epic 245-day Viking Ultimate World Cruise. Free VISA service, Silver Spirits Beverage Package, unlimited wifi and more. Free Business Class Air + Transfers, $4,000 Shore Excursion Credit pp., $2,000 Shipboard Credit pp. Beverage Package and more - Book by May 31, 2018! All this is included in your 2019/2020 VIKING ULTIMATE WORLD CRUISE VALUE fare from $92,990. Ground transfers to/from the ship; private car transfers for all guests on the 245-day Viking Ultimate World Cruise. $4,000 per person shore excursions credit, which can be used toward optional shore excursions or overland tours. $2,000 per person shipboard credit, which can be used toward spa services, onboard shops & beverages. Viking Explorer Society Exclusive Bonus, an additional $2,000 per person shipboard credit plus, exclusive Viking Explorer Society Member savings. Over $40,000 value per guest. Expand your horizons on this comfortable, award-winning ship, intimate and thoughtfully created by experienced nautical architects and designers to enrich your interaction with your destination in every way. The Viking Sun was built in 2017 and holds 930 guests. Our intimate, all-veranda ships offer a wide variety of staterooms for your selection. From Veranda Staterooms to the abundance of extra perks and amenities in our spacious Explorer Suites, there’s no finer way to travel. And whichever stateroom you choose, you will find it beautifully designed in the understated elegance for which Viking is known. 2019-2020 Viking Ultimate World Cruise Savings: Offer applies to new bookings from May 01, 2018 - May 31, 2018. Cruise from $92,990 USD per person based on Aug 31, 2019 departure of Viking Ultimate World Cruise in Category V2; other categories may be higher, please call for details. Combinable with Referral Rewards and Viking Explorer Society Member Travel Credits. Additional restrictions may apply. A deposit of $10,000 is due by May 31, 2018; pay in full by Feb 28, 2019. Prices are in US dollars and for US residents only. Additional restrictions may apply. Viking Ultimate World Cruise Value Offer with included benefits expires Dec 31, 2018. Pricing offer expires on May 31, 2018. Air Promo: FREE roundtrip business class air from select gateway cities. Air prices are per person based on cruise/cruisetour check-in date and include transfers. Air seats are limited; airfares are subject to change until full payment of air is received. If air is not purchased from Viking, transfers may be purchased separately. All transfers must be in conjunction with a Viking-purchased cruise, cruisetour, land extension or extra hotel nights. Air does not have to be purchased to get cruise/tour offer. Additional airline-imposed baggage charges may apply; for more information visit Airline Luggage Restrictions. Air prices are per person based on cruise/cruisetour check-in date and include transfers plus all government taxes/fees of approximately $160 USD and air fuel surcharges. Air seats are limited; airfares are subject to change and are not guaranteed until full payment of air is received. For more information about customized air services and US gateways, visit the Viking Air Plus page. Book by May 31, 2018. Offer expires May 31, 2018.